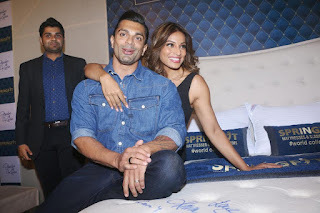 Bipasha Basu urges sound sleep at night to springfit in morn! If Sleeping Beauty were here today in a fairytale adventure in India, she would probably attribute her sound sleep to *Springfit Mattresses. * No wonder, the Indian brand has chosen the sultry *Bipasha Basu* and her better half *Karan Singh Grover* as the *Brand Ambassadors* of Springfit Mattresses’ and launched the *Young and Trendy Autograph Collection* along with a TVC shoot for the brand at Film City at the hands of the power couple alongside *Nitin Gupta, Executive Director, Springfield Mattresses* and *SK Malhotra, Head, Sales and Marketing* of the brand. “Springfit is an Indian company that has a mattress for almost every budget from 20,000-250,000. If you have experienced the comfort of a five star bed, you know it is mostly Springfit. I personally love the comfort of the bed,” gushed Bipasha Basu. Basu-launched Autograph Collection comes at the same time as the international expansion plans of the company that boasts of over one billion sales with production facilities at Coimbatore, Meerut, and Haridwar. Studies reveal that six-hours of comfortable sleep is a stressbuster keeping in mind, the current lifestyle trends. Springfit Matresses is a must for power nappers as much. "Springfit is also one of the fastest-growing and most premium mattress brands in India with 100 distributor and 2000 dealers with highly reliable quality products. It feels good when you stand for a premium brand that is responsible for us getting sound sleep in this stressful time,” adds Karan Singh Grover.